Latina Bloggers Connect and Neutrogena want everyone to feel beautiful inside and out this spring and summer so with help from Elizabeth Ulloa, Neutrogena's Hispanic Beauty Ambassador, they have created a beauty and skincare regimen to achieve a beautiful look. I was lucky to have been sent a package with a lot of Neutrogena products to test out and review on my blog which made me really excited because I've never tried Neutrogena makeup products before. To kick start my spring break I've decided to share a music playlist. Its no secret that I love music and I want to share my love with all of you with monthly Spotify playlists! 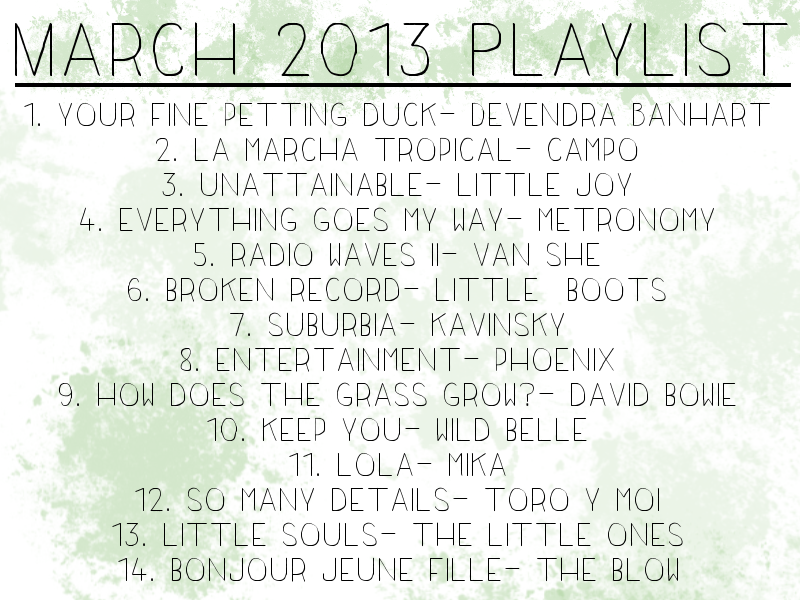 There has been some great releases in the month of March like David Bowie's, Kavinsky's, and Devendra Banhart's new albums so I made sure to include a song from each album on the playlist. There are also some older tracks like Unattainable and Bonjour Jeune Fille which I still love listening to. 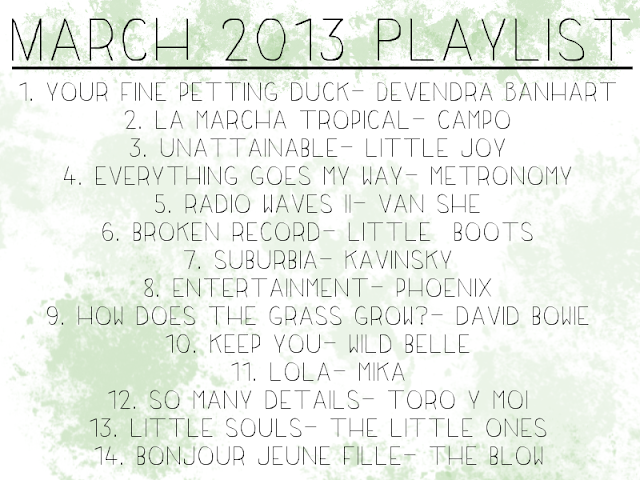 I really hope you enjoy the first installment of my monthly playlists! I've always been intrigued by Lush skincare products because they look different to what you usually buy at stores. Since I've never used any Lush skincare product before I went into Lush to ask for a sample of the Herbalism cleanser which is a cleanser made for oily skin people. Luckily the lady gave me a generous sample that lasted me two weeks so I was able to try the product and develop my opinion about it. One more week of school left till Spring Break! YESS! This past weekend I went down to Tijuana to take my chow chow, Buster, to the vet and also see my grandmother. Since the whole outing was very laid back, I decided to keep things pretty casual and comfortable. Unfortunately this post will be shorter than others because my mom really doesn't know how to use an DSLR (durp!). See that little $3.50 off coupon on the right column on my blog? Well I did! As soon as I put the banner up I knew I had to go on Ulta.com to see if I could pick up any items that I've been meaning to try out with that discount. I freaking hit the (mini) jackpot when I saw that both NYX and Revlon had "buy one, get one 50% off" deals. SCORE!!! To see what I purchased keep on reading. Back on my "mail time!" post I mentioned how the Sibu Beauty face and body bar had completely changed my skin so I got asked to write a more in depth review about my holy grail skin care product. Now that I finished my third bar and was finally able to open a new box, I'm ready to explain why I am head over heels about this $7 bar of soap. Happy Monday everyone! This past weekend I went up to Orange County for a friend's birthday so on the way up north I decided to record a very quick and easy makeup tutorial on the Amtrak Pacific Surfliner. Hope you enjoyed the video and have a great day! While I was living in Paris I got the opportunity to try some Bourjois products and I fell in love with the Volume Glamour Max Waterproof Mascara so when I saw the Volume Glamour Max Definition Mascara launch during my time there I decided to pick it up and take it back home with me. I bought the mascara thinking that it would be much like the Glamour Max Waterproof (which became my favorite mascara of all time) and a couple of French beauty gurus raved about this new version, unfortunately I found this mascara to be pretty disappointing. I have been waiting for this package to arrive ever since I made the purchase about a week ago. I ordered some jewelry from Shop Lately right after watching Mallory's February Favorites video. She replied to my comment and told me how the pieces are extremely affordable so I decided to go check out the website and you know what? The pieces are very affordable. There are a lot of pieces that are less than $10 which is great! On Saturday my family and I went to Tijuana to celebrate my dad's birthday. The fancy-ish dinner provided me with the perfect opportunity to wear some of the items I bought on Friday when I went thrifting with my boyfriend. I may dislike birthdays but if it requires me to dress up then I'm ok with them. What can I say? I'm a sucker for dressing up, even if I just feel like a derp pretending to be a lady. Review | New Rimmel Products! I probably haven't been inside a K-Mart in about 7 years or so, but I had to go recently when I saw this storage thing I really wanted for my makeup collection on sale. So I went with my mom and although the store hasn't changed much since I moved to the United States, I did notice that their makeup selection is surprisingly good! They had everything from L'Oreal to the Elf Studio Line but what really caught my eye was the Rimmel display. I noticed there were a ton of products that I had only heard the British YouTube gurus talk about so I decided to pick up the Wake Me Up Concealer and a Scandaleyes Waterproof Kohl Kajal. I wanted to do something different for today's face of the day so instead of doing another bold lip I decided the eyes would be the focus of today's look. I absolutely love how purple looks against my skin tone and eyes but instead of putting purple eyeshadow all over my lids, I just decided to use it on the bottom lash line for a pop of color so it wouldn't look so obnoxious. Keep reading to find out how I created this look. On Friday the French electronic music record label, Ed Banger, celebrated their 10th anniversary with a huge party in Paris named Ed Bangerland. Unfortunately I was not in Paris for the festivities which made me so sad that I refused to watch the live webcast. Sad I know, but you try missing a place as much as I miss Paris. Alright, back to Ed Banger... To celebrate their 10th year anniversary I decided to wear my Justice tour t-shirt! Keep reading the post to see what else I wore on my very casual Sunday.